Swifts take quite readily to artificial nest boxes. This page shows you how to build one of my various designs. I’ve found that swifts seem to prefer boxes with bottom entrances and landing strips if given a choice. They also like boxes with dark interiors. However if you would rather buy one instead go to my swift boxes to buy page for more details. Before you begin there are a few general tips worth taking into account. Firstly it’s a great help to have swifts nesting nearby or at the very least swifts that fly high overhead. If you do then you are half way there. Unfortunately if you haven’t then it could be difficult to attract swifts, but not impossible. Secondly, If you know you have swifts nesting already around your house, try and install your new boxes as close to them as possible. It also helps if the entrance hole is a similar shape and angle as the natural hole, for example if your swifts enter via a downwards facing entrance hole install boxes with the same aspect. Likewise if your swifts fly straight in without landing momentarily, fit boxes with their entrances on the front without a landing strip. The nest box ideally should be at least 5 metres above the ground, although swifts have been known to nest as low as 1.5 metres. The nest box can be fitted to any aspect, however if fitted on the south side precaution should be taken to avoid the mid-day sun (maybe by painting it a light colour).Most importantly, take care when putting it up and don’t take any risks on a ladder – please read Swift Conservation website ‘Fitting nest box safety guidelines’ and Ladder Safety. The flight path into the nest box should be free from nearby obstacles such as trees or wires. Finally a sound system located next to the nest box playing swift attraction calls really helps attract swifts. Play the calls as loud as you can without annoying your neighbours – read details of When to play Swift Calls CD/mp3 at bottom of page. I have been making and adapting my swift box designs for over 13 years. I found that my designs with a bottom entrance have the highest occupancy rate. All my boxes (except for the shoebox design) are made to fit under soffits which are less than 150mm deep. The shoebox design is for soffits over 200mm deep. The twin box is quite heavy and awkward to handle, so I would recommend two people install it. This is the main reason behind my single box designs in 2015 and 2016, which retained all the good points of my twin box design but are much lighter to handle. In 2015 I included a couple of new designs which are easier to make and a lot cheaper, costing less than £10 per box. They are both made to fit under wooden soffits less than 150mm deep. The Zeist box has a front entrance and has been around for many years, whilst my single compartment box is just a smaller version of my twin box design with a bottom entrance and landing strip. My 2016 shoebox and corner box designs are specifically for use under deep soffits, which are over 200mm. The key to the long term security of swifts in the UK is to encourage the building industry to incorporate swift bricks into the walls of new builds on a regular basis. It’s already started to happen on some building sites, but a lot more still needs to be done. The beauty of these boxes is once they are installed there’s no need for any future maintenance unlike external nest boxes. So if you’re thinking of building a new house or planning major building refurbishment then internal swifts boxes should be considered. There are lots of commercial swift bricks available to choose from which should suit every type of new building or extension. The 2017 trial results confirmed that if given a choice swifts preferred boxes with dark interiors. So in readiness for the start of the 2018 season the interiors of all 25 boxes were painted black. At the end of the season the number of breeding pairs had increased from 11 to 15. I would recommend anyone thinking of installing a box to paint the interior black, as I think it definitely improves your chances of success. Swifts seem to prefer to nest in as dark a recess as possible, actively seeking out places which seem pitch black to us. So I painted the interiors in 3 of my boxes black to trial in 2017. 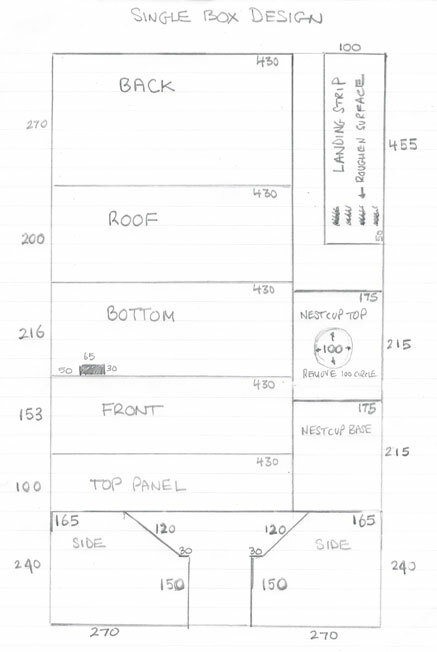 I chose my smaller box designs as historically they only had a 30% occupancy rate, compared to my longer boxes which have an occupancy rate closer to 70%. Although these smaller boxes are regularly visited by prospecting swifts they are rarely used as nest sites. I’ve wondered if this is because they are too bright inside compared to my longer boxes. So in readiness for the 2017 season I painted the interiors of 2 corner boxes and 1 Zeist box black inside, using a matt black emulsion. For comparison 3 similar boxes were left unpainted. At the end of 2017 season I noted all 3 boxes with black interiors were occupied, whereas only 1 of the unpainted boxes was used. Swifts seem to prefer corner boxes if given a choice. I have therefore designed a new box to fit under deep soffits which are over 200mm (8 inches) deep. It is easy to make and if you live in a detached or semi-detached house this could be the box for you. The materials cost under £20, making each box less than £10. A single sheet of 12mm exterior hardwood ply 1829mm x 607mm is big enough to make two corner boxes. You’ll also need per box – 2 x 50mm brackets to fix the box to the soffit, a handful of 25mm galvanised nails, 4 x 25mm screws, 2 x 25mm brackets and some adhesive to fasten the landing strip. I tend to use adhesive on all the sections before I nail them together. This gives each section more strength and makes the box much stronger overall. I only use screws on the top section to give easy access. Details about how to make the nest cup are below. Paint or stain the nest box to suit your location. If you’re lucky enough to have large soffits which are over 200mm deep (8 inches) then I’ve designed a simple oblong style swift box which is cheap and very easy to make. I have installed one next to my other boxes in 2016 to test how successful it is. Update – The good news is that this box was occupied almost immediately once it was up. 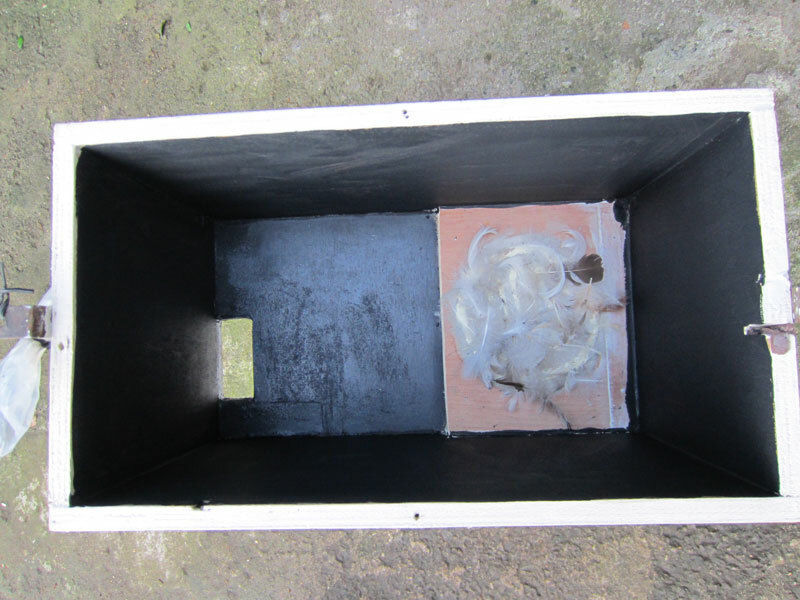 A pair of swifts used this box regularly throughout the summer and I’m hoping they’ll return next year to breed. A single sheet of 12mm exterior hardwood ply 1220mm x 606mm is big enough to make two of these small oblong boxes. You’ll also need per box – 3 x 50mm brackets, a handful of 25mm galvanised nails, 4 x 25mm screws, 2 x 12mm panel pins and some adhesive. I use the adhesive on each section before I nail them together, essential when fixing the landing strip in position. This gives each section more strength and makes a much stronger box. However I only use screws on the top section to give easy access. Paint or stain the nest box to suit your location. All of the materials cost under £20, making each less than £10 per box. I’ve made this box with a bottom entrance as this is my most successful entrance position. I’ve also modified the landing strip to mimic an opening in-between two rafters and changed the angle to 90 degrees as I’m interested to see how well this works. However if you prefer you can always install the landing strip as per my other boxes. The reason I’ve changed it is because when I observe swifts prospecting for nest sites they seem to prefer trying to squeeze in-between very small gaps. I’m hopeful that this new design will suit their curiosity. I’ve also glued a small triangular baffle (approx H100 x W70 x angle length 110mm) inside the box (see below). I think swifts prefer to nest out of the wind, plus it makes the nest cup slightly darker which again I think they like. I have baffles inside all my swift boxes which seem to work very well. 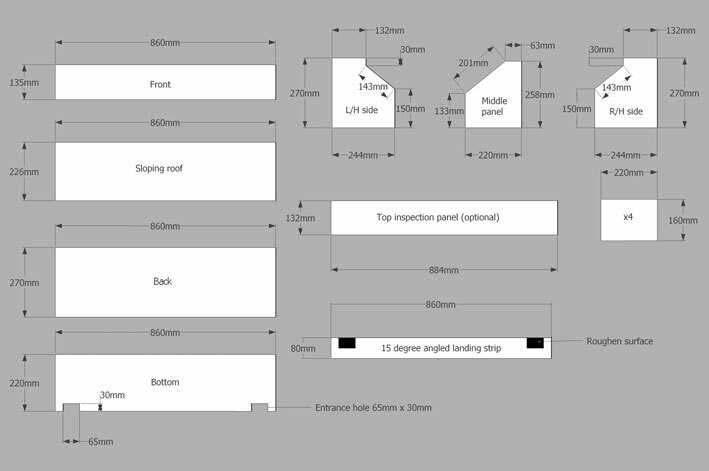 If you have soffits that are 150mm or less then this swift nest box design can be attached. A single sheet of 12mm exterior hardwood ply 1220mm x 606mm is big enough to make two small swift boxes. You’ll also need per box – 2 x 50mm brackets, a handful of 25mm galvanised nails, 3 x 25mm screws and some adhesive. I use the adhesive on each section before I nail them together to give it more strength, all except the top section where I use screws, so I can gain access. All of these materials cost under £20, making each less than £10 per box. Paint or stain the nest box to suit your location. I installed three new boxes in April 2015, two facing west and one facing south. One of the boxes on the west side was successful and was occupied by a pair of non-breeders in early June. The other two boxes remained unoccupied. One thing I did notice however, is that the swifts using this box preferred to fly straight in without landing momentarily as they do on my other boxes with downward facing entrances. The standard oblong entrance hole (30mm x 65mm) made this manoeuvre rather difficult so I’ve changed it to a D-shaped design (30-32mm x 65mm) to give them a bit more headroom. I’ve also added a gripper ring around the entrance as well, see photos below. Note If sparrows or starlings become a problem, block up the entrance hole with something and only remove it once the first swifts have arrived. My twin box design is very successful, but heavy to handle especially when trying to fix it under the eaves perched on top of a ladder. To get over this problem in Summer 2015 I decided to make a single compartment version based on the twin box dimensions. 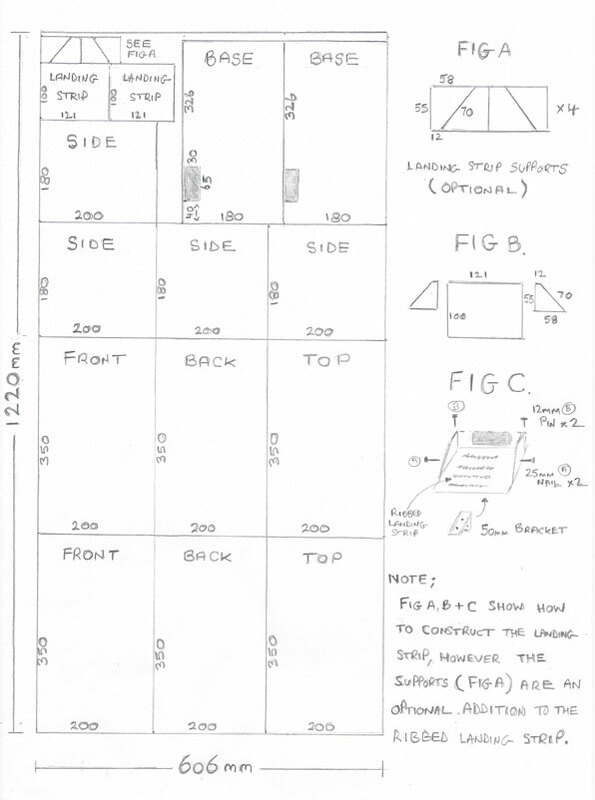 To make it you will need 12mm exterior hardwood ply 1220mm x 606mm and also – 5 or 6 x 50mm brackets, a handful of 25mm galvanised nails, 2 x 25mm screws and some adhesive. I use the adhesive on each section before I nail them together to give it more strength, that is all except the top section where I use screws so I can gain access. Remember the landing strip should be angled outwards by about 15 degrees and fitted flush under the entrance hole so that’s there’s no lip, secure using 3 brackets. All of this you can buy for around £10 to £15. Note if starlings are a problem reduce the entrance hole size by 2mm to 28mm x 65mm. If sparrows are a problem block up the entrance holes with something and only remove once the first swifts have arrived. Also this box is designed to fix under the eaves so the top panel isn’t 100% watertight. If you plan to fit this type of box in the open replace the top panel with a slightly larger one measuring 150mm x 454mm. A single sheet of 12mm exterior hardwood ply 2440mm x 1220mm is big enough to make two of these twin compartment boxes. You’ll also need per box – 5 or 6 x 50mm brackets, a handful of 25mm galvanised nails, 2 x 25mm screws and some adhesive. I use the adhesive on each section before I nail them together to give it more strength, that is all except the top section which I use screws so I can gain access. All of this you can buy for around £50, working out at about £25 per twin box. Paint or stain the nest box to suit your location. The square side access panels shown in the above photos aren’t essential. I only made them in case I needed to work on the internal cameras during the breeding season, as this wouldn’t disturb the swifts too much. I have rarely had to use them yet though! Fellow swift enthusiast Michael Osborne has kindly created the following scale diagrams below based on my original twin box design. The top inspection panel isn’t essential, but finishes it off well. The roughened surface under each hole is made by using self adhesive glue in lines about 2cm apart. Black/dark paint at the entrance helps swifts locate the entrance hole. The angle of the landing strip should be around 15 degrees and should be flush against the entrance hole. 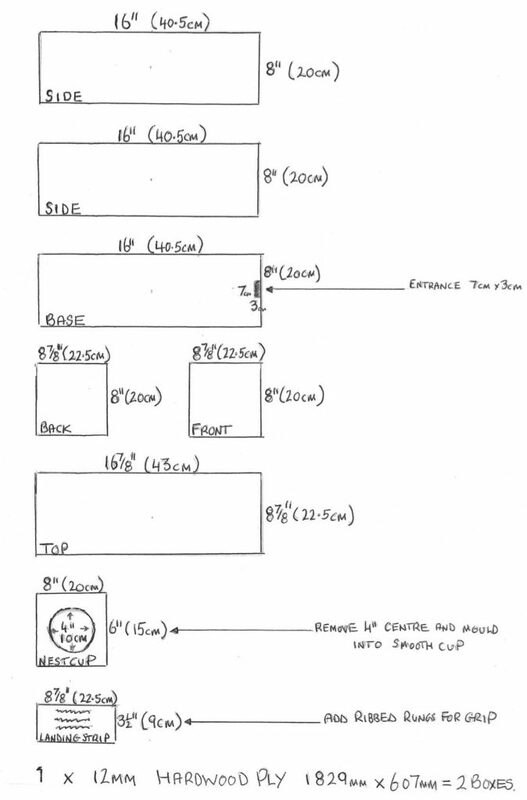 Here is a printable version of these twin box instructions Swift nest box design. Please note – if starlings are a problem in your area then reduce the entrance hole size to 28mm x 65mm to deter them from entering. If sparrows are a problem block up the entrance holes with something and only remove once the first swifts are back. There are all sorts of other box designs available to buy if you are looking for something different to try. Making the nest cup is quite simple, the only real difference between both box designs is the nest cup size. In the Zeist box the nest cup is slightly smaller than it is in the twin compartment box. 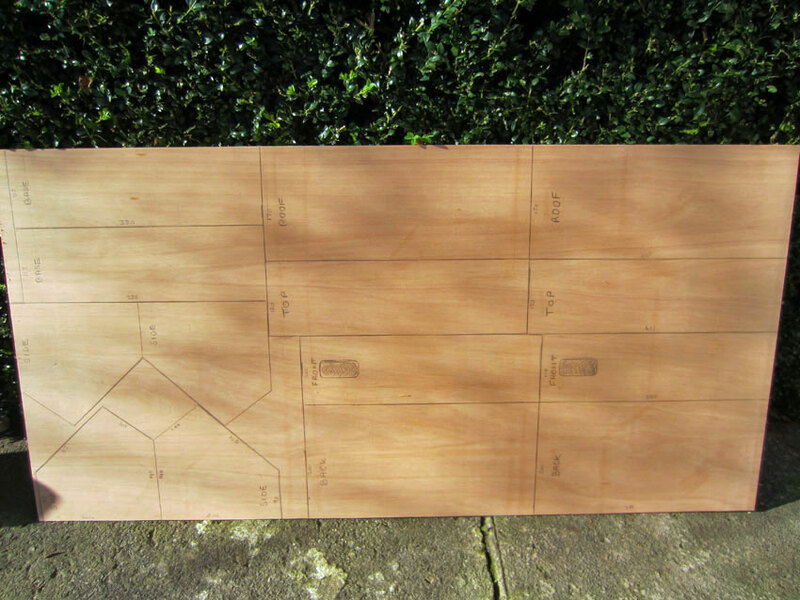 For the twin compartment nest box you will need two 220mm x 160mm pieces of plywood. For the Zeist box, you’ll need two x 180mm x 130mm pieces of plywood. Cut a 100mm diameter circle in one piece (I used a paint can as a template) and then join both sections together. Fill the hole with filler and mould into a shallow cup. After the filler has set, glue nest cup into position at furthest point away from the entrance hole. It also helps to stick some soft feathers (old feather pillows are ideal), thistle down or dried hay to the nest cup as a starter nest. I have installed wireless bird box cameras inside all my boxes, see the photos below. I use them to monitor and record the progress of my swifts each year, from nest building to egg laying and eventually the chicks fledging. The camera’s I use can be purchased as a Starter Kit from SpyCameraCCTV and you can add as many individual cameras as you want. We have negotiated a 15% discount on these starter kits – please email via our Contact page for details. See examples of videos filmed from inside my swift boxes using these cameras on the Swift Gallery page. The first wave. These normally arrive in the last week in April – early May and consist mainly of breeding adults returning to their traditional nest sites. It is difficult to attract these to a new site (box) as they are extremely site faithful, however displaced breeding adults will take up residency in new homes but it’s rare. You can play your CD/mp3 anytime from now but the chances of attracting any are slim. The second wave. These start to arrive from the end of May and into the first half of June. These are the ones you are after. These are 2-3 year old birds looking for a nest site. They are definitely attracted by the CD/mp3 calls and will fly up to an investigate wherever the sound is coming from. Try and place your speakers as near as you can to your box and play it as loud as you can (with neighbours agreement). Play whenever the weather is calm. Avoid wet and windy days as swifts don’t prospect for new nest sites in bad weather. Best times to play your CD/mp3 is from 6 -11am and again from 8-10pm. If you’re lucky enough to attract a pair they will spend the rest of the summer building a new nest ready for next year. The third wave. These arrive in the middle of July. They are yearlings returning for the first time. They are interested in joining a colony and will visit several in the local area to suss out the best ones. They might even enter one of your boxes, roosting in it until they leave in August, but they won’t start nest building until the following year. They are also attracted by the CD/mp3, so play as described above. 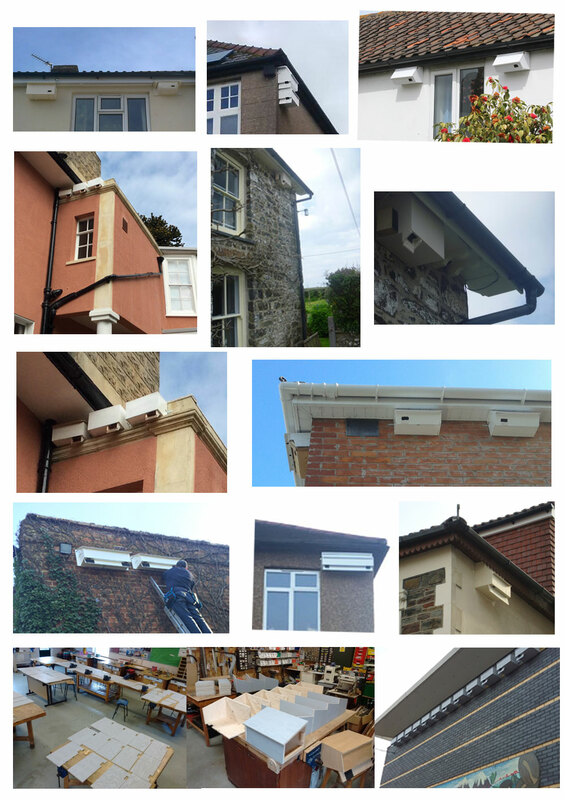 Here are a few photos of swift nest boxes based on my designs that have been made and installed by fellow swift enthusiasts around the UK. For more see Photos of your Swifts Boxes page. Good Luck – please send us photos of nest boxes you make using the above designs and let us know how you get with attracting swifts.